VorTex Soft T230 is a 100% polyester knitted fabric treated specifically for dye-sublimation transfer, latex and UV printing. 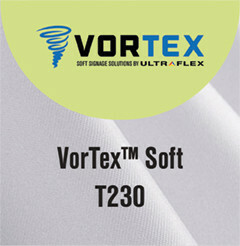 VorTex Soft T230 is the light weight version of VorTex Heavy T340. Ideal for banners and table throws due to its optimally smooth print surface and soft drape characteristics.